The latest reviewed version was approved on 4 November 2018. There are 4 pending changes awaiting review. 2.2 Where did the State constructor go? If you have programmed in any other language before, you likely wrote some functions that "kept state". For those new to the concept, a state is one or more variables that are required to perform some computation but are not among the arguments of the relevant function. Object-oriented languages like C++ make extensive use of state variables (in the form of member variables inside classes and objects). Procedural languages like C on the other hand typically use global variables declared outside the current scope to keep track of state. In Haskell, however, such techniques are not as straightforward to apply. Doing so will require mutable variables which would mean that functions will have hidden dependencies, which is at odds with Haskell's functional purity. Fortunately, often it is possible to keep track of state in a functionally pure way. We do so by passing the state information from one function to the next, thus making the hidden dependencies explicit. The State type is designed to simplify this process of threading state through functions. In this chapter, we will see how it can assist us in a typical problem involving state: generating pseudo-random numbers. Generating actual random numbers is hard. Computer programs almost always use pseudo-random numbers instead. They are "pseudo" because they are not actually random, and that they are known in advance. Indeed, they are generated by algorithms (the pseudo-random number generators) which take an initial state (commonly called the seed) and produce from it a sequence of numbers that have the appearance of being random. Every time a pseudo-random number is requested, state somewhere must be updated, so that the generator can be ready for producing a fresh, different random number the next time. Sequences of pseudo-random numbers can be replicated exactly if the initial seed and the generating algorithm are known. randomIO is an IO action. It couldn't be otherwise, as it makes use of mutable state, which is kept out of reach from our Haskell programs. Thanks to this hidden dependency, the pseudo-random values it gives back can be different every time. Suppose we are coding a game in which at some point we need an element of chance. In real-life games that is often obtained by means of dice. So, let's create a dice-throwing function. We'll use the IO function randomRIO, which allows us to specify a range from which the pseudo-random values will be taken. For a 6 die, the call will be randomRIO (1,6). As for (,), it is the non-infix version of the tuple constructor. That being so, the two die rolls will be returned as a tuple in IO. Implement a function rollNDiceIO :: Int -> IO [Int] that, given an integer (a number of die rolls), returns a list of that number of pseudo-random integers between 1 and 6. A disadvantage of randomIO is that it requires us to use IO and store our state outside the program, where we can't control what happens to it. We would rather only use I/O when there is an unavoidable reason to interact with the outside world. To avoid bringing IO into play, we can build a local generator. The random and mkStdGen functions in System.Random allow us to generate tuples containing a pseudo-random number together with an updated generator to use the next time the function is called. In random generator :: (Int, StdGen), we use the :: to introduce a type annotation, which is essentially a type signature that we can put in the middle of an expression. Here, we are saying that the expression random generator has type (Int, StdGen). It makes sense to use a type annotation here because, as we will discuss later, random can produce values of different types, so if we want it to give us an Int we'd better specify it in some way. That, of course, is clumsy and rather tedious, as we now need to deal with the fuss of carefully passing the generator around. Implement a function rollDice :: StdGen -> ((Int, Int), StdGen) that, given a generator, return a tuple with our random numbers as first element and the last generator as the second. The implementation of clumsyRollDice works as a one-off, but we have to manually pass the generator g from one where clause to the other. This approach becomes increasingly cumbersome as our programs get more complex, which means we have more values to shift around. It is also error-prone: what if we pass one of the middle generators to the wrong line in the where clause? What we really need is a way to automate the extraction of the second member of the tuple (i.e. the new generator) and feed it to a new call to random. This is where the State comes into the picture. The Haskell type State describes functions that consume a state and produce both a result and an updated state, which are given back in a tuple. Here, s is the type of the state, and a the type of the produced result. Calling the type State is arguably a bit of a misnomer because the wrapped value is not the state itself but a state processor. Where did the State constructor go? which does the same job. As for why the actual implementation is not the obvious one we presented above, we will get back to that a few chapters down the road. So far, all we have done was to wrap a function type and give it a name. There is another ingredient, however: for every type s, State s can be made a Monad instance, giving us very handy ways of using it. To define a Monad instance, there must also be instances for Functor and Applicative. As we explained previously, these superclass instances can be derived as follows from the Monad instance that we are about to define in more detail. Reimplement these instances by using explicitly the State constructor and functions instead of relying on the Monad instance. So let's define this instance. Note the instance is State s, and not just State: on its own, State can't be made an instance of Monad, as it takes two type parameters, rather than one. That means there are actually many different State monads, one for each possible type of state - State String, State Int, State SomeLargeDataStructure, and so forth. However, we only need to write one implementation of return and (>>=); the methods will be able to deal with all choices of s.
Giving a value (x) to return produces a function which takes a state (s) and returns it unchanged, together with the value we want to be returned. As a finishing step, the function is wrapped up with the state function. let (x, s1) = runState p s0  -- Running the first processor on s0. in runState (k x) s1         -- Running the second processor on s1. (>>=) is given a state processor (p) and a function (k) that is used to create another processor from the result of the first one. The two processors are combined into a function that takes the initial state (s) and returns the second result and the third state (i.e. the output of the second processor). Overall, (>>=) here allows us to run two state processors in sequence, while allowing the result of the first stage to influence what happens in the second one. 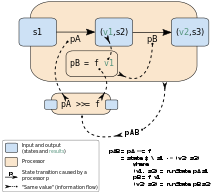 Schematic representation of how bind creates a new state processor (pAB) from a state processor (pA) and a processor-making function (f). s1, s2 and s3 are states. v1 and v2 are values. pA, pB and pAB are state processors. The wrapping and unwrapping by State/runState is implicit. One detail in the implementation is how runState is used to undo the State wrapping, so that we can reach the function that will be applied to the states. The type of runState p, for instance, is s -> (a, s). Another way to understand this derivation of the bind operator >>= is to consider once more the explicit but cumbersome way to simulate a stateful function of type a -> b by using functions of type (a, s) -> (b, s) , or, said another way: a -> s -> (b,s) = a -> (s -> (b,s)). These classes of functions pass the state on from function to function. Note that this last signature already suggests the right-hand side type in a bind operation where the abstract type is S b = (s -> (b, s)). Now that we have seen how the types seem to suggest the monadic signatures, lets consider a much more concrete question: Given two functions f :: s -> (a, s) and g :: a -> s -> (b, s), how do we chain them to produce a new function that passes on the intermediate state? This code is the implementation of (>>=) shown above, with wrap = state and unwrap = runState, so we can now see how the definition of bind given earlier is the standard function composition for this special kind of stateful function. This explanation does not address yet where the original functions Wrapped a and a -> Wrapped b come from in the first place, but they do explain what you can do with them once you have them. Given a state (the one we want to introduce), put generates a state processor which ignores whatever state it receives, and gives back the state we originally provided to put. Since we don't care about the result of this processor (all we want to do is to replace the state), the first element of the tuple will be (), the universal placeholder value. The resulting state processor gives back the state s it is given in both as a result and as a state. That means the state will remain unchanged, and that a copy of it will be made available for us to manipulate. As we have seen in the implementation of (>>=), runState is used to unwrap the State s a value to get the actual state processing function, which is then applied to some initial state. Other functions which are used in similar ways are evalState and execState. Given a State a b and an initial state, the function evalState will give back only the result value of the state processing, whereas execState will give back just the new state. Time to use the State monad for our dice throw examples. We want to generate Int dice throw results from a pseudo-random generator of type StdGen. Therefore, the type of our state processors will be State StdGen Int, which is equivalent to StdGen -> (Int, StdGen) bar the wrapping. -- The StdGen type we are using is an instance of RandomGen. First, we take out the pseudo-random generator from the monadic context with <-, so that we can manipulate it. Then, we use the randomR function to produce an integer between 1 and 6 using the generator we took. We also store the new generator graciously returned by randomR. We then set the state to be the newGenerator using put, so that any further randomR in the do-block, or further on in a (>>=) chain, will use a different pseudo-random generator. Finally, we inject the result back into the State StdGen monad using return. We can finally use our monadic die. As before, the initial generator state itself is produced by the mkStdGen function. Under the hood, state is being passed through (>>=) from one rollDie computation to the other. Doing that was previously very clunky using randomR (1,6) alone because we had to pass state manually. Now, the monad instance is taking care of that for us. Assuming we know how to use the lifting functions, constructing intricate combinations of pseudo-random numbers (tuples, lists, whatever) has suddenly become much easier. Similarly to what was done for rollNDiceIO, implement a function rollNDice :: Int -> State StdGen [Int] that, given an integer, returns a list with that number of pseudo-random integers between 1 and 6.
which produces a modified copy of the state while leaving the state itself unchanged. Write implementations for them. Until now, we have used only Int as type of the value produced by the pseudo-random generator. However, looking at the type of randomR shows we are not restricted to Int. It can generate values of any type in the Random class from System.Random. There already are instances for Int, Char, Integer, Bool, Double and Float, so you can immediately generate any of those. For writing allTypes, there is no liftA7, and so we resort to plain old (<*>) instead. Using it, we can apply the tuple constructor to each of the seven random values in the State StdGen monadic context. allTypes provides pseudo-random values for all default instances of Random; an additional Int is inserted at the end to prove that the generator is not the same, as the two Ints will be different. If you are not convinced that State is worth using, try to implement a function equivalent to evalState allTypes without making use of monads, i.e. with an approach similar to clumsyRollDice above. ↑ A common source of seeds is the current date and time as given by the internal clock of the computer. Assuming the clock is functioning correctly, it can provide unique seeds suitable for most day-to-day needs (as opposed to applications which demand high-quality randomness, as in cryptography or statistics). ↑ If you need a refresher on applicative functors, have a look at the first section of the Prologue. ↑ The technical term for both () and its type is unit. ↑ Beyond liftA3, the standard libraries only provide the monad-only liftM4 and liftM5 in Control.Monad.